Beltane is a day for fertility rites, light-hearted celebration and sexual revelry, for love-chases, maypole dancing and performing the Great Rite to honor the Mother: make May Baskets and weave flower garlands - choose a May Queen to represent the Goddess - wear green and crowns of flowers - dance naked in the crops or ride a broomstick through the fields, for the fertility of the land - leave offerings for fairies - gather in sacred groves - pay homage to your household gods. In the Wheel of the Year the Goddess and God reach young adulthood; both are in their green prime. They become lovers and consummate their union. There is joy throughout the land. Prepare a May basket by filling it with flowers and goodwill, and then give it to one in need of caring, such as a shut-in or elderly friend. Beltane is one of the three "spirit-nights" of the year when the faeries can be seen. At dusk, twist a rowan sprig into a ring and look through it, and you may see them. Or use what ever colors and words have special meaning to you. Cut branches of fresh green from budding trees, or make garlands of flowers to decorate the home for this celebration. Hang them on the doors and windows early, so the may sunrise finds them there! Herbs - Primrose, yellow cowslip, hawthorn, roses, lily of the valley, honeysuckle, birch trees, rosemary, and lilac. Also included are almond, angelica, ash trees, bluebells, cinquefoil, daisies, frankincense, ivy, marigolds and satyrion root. The pretty cowslip flower is one of the magickal herbs of Beltane. It is also called Fairy Cup, and Freya's Key (because the flowers resemble a bunch of keys). They have been grown in the British Isles for both magickal and medicinal uses and were a common flower of the Medieval garden. 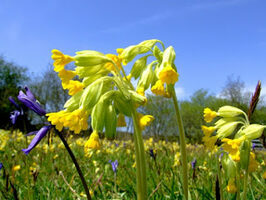 Cowslips are associated with the Planet Venus, the Goddess Freya, and the Element of Water. Cowslip magick includes protection, unlocking secrets, and healing. Wearing a Cowslip flower will preserve or regain your youth. If you wish to avoid visitors, place a piece of Cowslip beneath your front porch and they will leave you in peace. At Beltane, Irish farmers would crush Cowslip leaves and put the juice on their cow’s udders to ensure that their milk wouldn’t be stolen by Faeries throughout the coming year. Cowslip flowers are favored by the Fey folk and growing them in your garden is said to attract them. The tiny Faeries are supposed to be fond of nestling in the drooping bells of Cowslips. Many rural people held Cowslip as sacred and would hang it above their doors as a magick charm of protection. Cowslip balls were carried proudly on May Day, and hung on cottage doors to bring good luck! Because of its association with the planet Venus, Cowslip is also an herb that may be used in all magick involving love and attraction. Cowslip is sacred to the Goddess Freya and is used in rituals to honor Her. 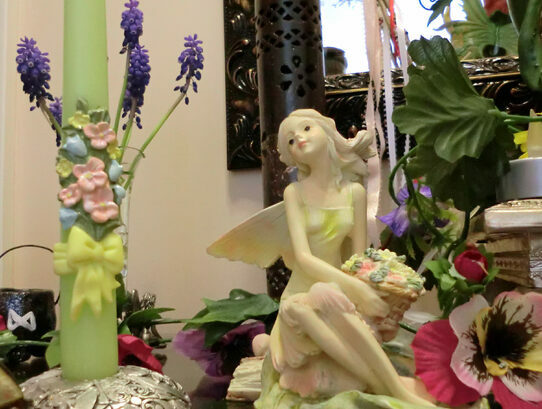 The flowers may be placed on an Altar dedicated to Her, dried, crushed, and burned as an incense or the fresh flowers may be used in magick oils, tinctures, and brews. Cowslips included in a bunch of spring flowers say 'You are my heart's delight'. Cowslip balls are made by hanging the flower heads from a string and tying the ends. The umbels are picked off close to the top of the main flower stalk and about fifty to sixty are hung across a string which may be stretched for convenience between the backs of two chairs. The flowers are then pressed carefully together and the string tied tightly so as to collect them into a ball. Care must be taken to choose only such heads or umbels in which all the flowers are open, as otherwise the surface of the ball will be uneven. Who am I going to be married to? The flowers' scent is considered healing and is similar to anise. The leaves and flowers can be added to salads, and leaves can be cooked as like spinach or added to soups and stews. The flowers (only the yellow part, not the green part) are made into a tea drunk as a remedy for headaches, dizziness, chills, head colds, cramps, nerve pain, falling sickness, palsy, and convulsions, as well as nightmares, frenzies, false apparitions. Hawthorn - Branches were used in Maypole Dances. St. John's Wort - Gathered at sunrise on May Day, brings good luck to the family for its undertakings, especially those begun on that day. Hang the root up in the house on May Day to keep out unwanted spirits. Ferns - collected at midnight on May Eve were believed to protect against evil influences and reveal hidden treasure. Rowan - Beltane is one of the three "spirit-nights" of the year when the faeries can be seen. At dusk, twist a rowan sprig into a ring and look through it, and you may see them. For we will be in the woods all night. And bells beyond the sand.